Digital Door Lock Deadbolt Tools - Buy It Now! Is this Keyless Lock for you? If you are looking for an inexpensive keyless combination lock that works on just about every door and cabinet, this digital lock may be just right for you. Where Can you Use this Keyless Lock? Bi-fold door hardware, keyless entry/keyless locks, door locks/door latches, barn door hardware, cabinet locks/security locks, combination door locks, bi-fold door hardware, combination lock, replaces electronic door locks, keyless door locks, combination locks, deadbolt/door hardware, deadbolt door locks, entry locksets high security door locks, home keyless entry keyless deadbolt, keyless entry systems patio door locks, power door locks, program keyless entry, screen door hardware. 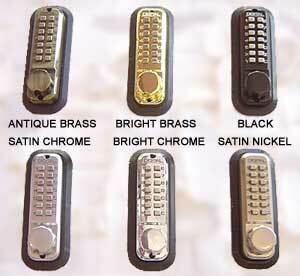 This is our most popular keyless combination lock because it inexpensive and works just about everywhere. People use it in their for homes, apartments, town homes, and condos and even throughout their businesses. You can lock or unlock the deadbolt without a key. This keyless combination digital door lock measures 1-5/8" by 5-1/2" so it fits most any door 1-1/4" to 2-1/2" thick. It comes complete with everything you need including all mounting instructions, and hardware needed to fit most any door application. It even comes with a trim plate that measures 2-1/2" x 6" which will cover a 2-1/8" hole. To install, simply remove the existing deadbolt from the top hole of your door and replace it with this lock. Then, in the bottom hole, install a matching lever or knob passage set as featured on our home page. It is as simple as that, but feel free to click here to view the Installation Instructions that come with each purchase. To unlock, simply type in your secret code on the keypad and turn the knob to retract the deadbolt. To give it a try, click here to go to our online demo. You'll be amazed at how easily it works!